Welcome. The following website describes the process of how I designed and built a 5 stop, 5 rank, all wood pipe organ for my house. I'm not an organist and I can barely play piano but I love music, organs and woodworking. Add to that that I'm a mechanical engineer and you have all the ingredients for a project like this. I first got interested in building my own pipe organ when I happened across the following website. 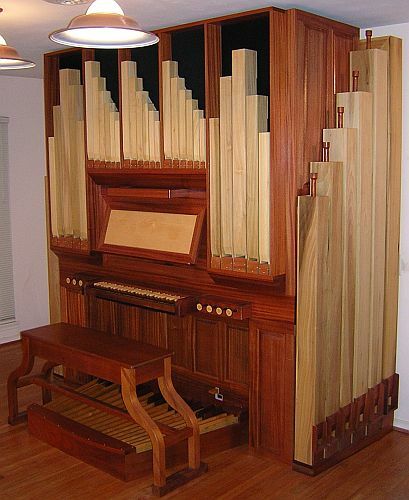 Once I saw that a pipe organ was something you could make in a wood shop, I was hooked and had to build my own. I spent about a year researching and designing the organ. I started construction in August of 2002 and finsihed in January of 2007. Click on the links to the left to learn more about my organ project.